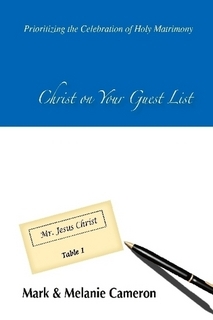 Christ on Your Guest List is an all encompassing Catholic Wedding Planner. I was especially intrigued by the title. Too often, engaged couples forget to include Christ in their planning and preparation. This book is a great resource which helps couples to remember to include Christ in their planning and preparation. This is definitely a book of “lists.” Checklists are included at the end of each chapter and there are various checklists for different events. I think this beautiful book should be on every bride’s “to buy” list. This entry was posted in Catholicity, Marriage, reviews, Writing and tagged Christ On Your Guest List. Bookmark the permalink. Sounds like a great book for couples. No one has a good marriage without Jesus.